stickboybike: Winter Bicycling Tip- frozen beverages. Winter Bicycling Tip- frozen beverages. Winter is here and base mile riding is in full effect. Or, at least I'm working on a 'full effect' type program. The real feel temps in the county are down to 22*F, the roads are cleared, chubby road tires are on the Bianchi Cavaria and there's a new winter riding jacket I'm itching to try out. I need to ride with some fluids on the bike despite not feeling like drinking. This is due in part to the sub-freezing temps and the other is from coming off a season of cyclocross racing. You don't drink during a cx race so you get weened off of needing to drink for an hour whether you want to believe it or not. 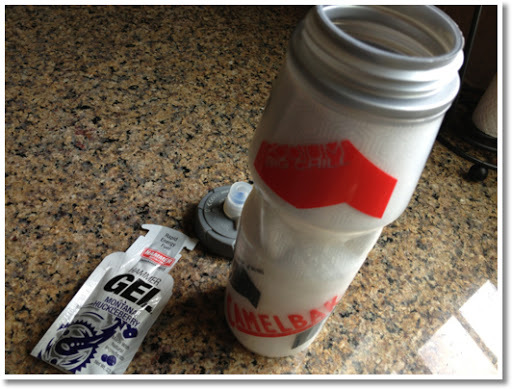 To keep the drink from freezing, I'm breaking out the summer time friendly Podium Big Chill bottle by Camelback, fill it with warm water, squeeze in a packet of Hammer Gel, shake it up... good for at least 30 miles, no slurpie drinking! Crosshairs Cycling PSA from In The Crosshairs on Vimeo.